This could be a snapshot of most days in my marriage, but it actually comes from a conversation that happened this morning. "See you at 9:40 for the parent-teacher conference." "I can get out my planner. The meeting is at 9:40." "Oh. See you at 9:35." It's frustrating when you write down times so that you can show up without making others wait on you, and those around you don't take that step. You can, of course, try to convert them to the Way of the Planner, but the truth is that some people aren't plannerds at heart. So what can you do? *Send meeting times or reminders via e-mail or text message. That way, when your beloved argues about a time, you have evidence that will not just prove you correct, but also save the relationship from the strain of an argument. No need to be snotty about it. Just be matter-of-fact. Show them the message. *Give them sticky note only access to your planner. Sticky note only access simply means that they can look at your planner to remember dates, and add them to your planner, but only with a sticky note. You write the time in your own planner, and keep the sticky note to prove their communication later. This lets you keep your own planner organized, but also teaches them how great of a tool a planner can be. Obviously, only do this with people that you trust. But my eight year old does it all the time and it works. 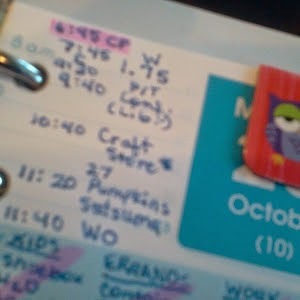 *Make a note in your planner when you convey appointment or task information. In the note section of my weekly spread, I write down the date and time that I asked my husband to change the windshield wipers. That way, when I bring my car to the shop and pay someone way too much to change them for me months later, he cannot complain about the cost. He slacked, and I have proof. I still prefer e-mail proof, but sometimes a jotted note has to do. *Keep a list of what you are waiting on in your planner. 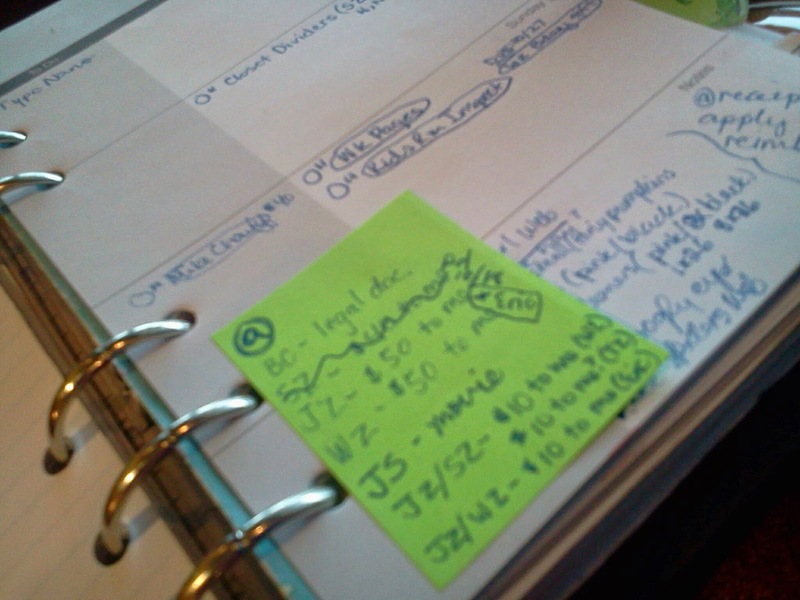 TIP: Keep a "waiting on" sticky note at all times, with a list of things that you are waiting on from others. I label mine @, which is my code for pending. I move it from week to week, at the bottom of my weekly spread. Right now, it lists some paperwork that I am waiting on, some small amounts of money owed to me (by my sisters, who always pay, but are a bit unplanned and appreciate that I keep track for them), and a movie that I lent to a friend. That @ spot is another great place to post WHEN you assigned something out. TIP: If you are constantly waiting on things from people - your spouse, your employee, your boss - then consider a Project called "Waiting On" and make a separate list for each person. *Remember that you have your own quirks, and try to accept theirs as nothing personal. This last tip is the hardest. It does feel personal when I take the time to plan, communicate, and be on time, and someone else does not show me that courtesy. But, honestly, my husband of almost 20 years is not likely to change anytime soon. So I have to accept it and work around it, just as he accepts my coffee habit, my moodiness, and my need to socialize in big groups. I so agree with all your points, but especially the last one. You can't change other people so you have to change your reaction to them. If you know they're late, you have to compensate. If you know they forget, you have to compensate. Doing that isn't to make it easier for them, it's to make it easier for YOU! Living on a hospital compound in Congo, my interruptions come more from constant stream of people at my door. It's a challenge to be patient with that 15th interruption to the same task or whatever, and realize that the person doesn't know they are part of a big string of interruptions.